G'day crafters! Can you tell I'm settling into this Aussie lingo;-) Still haven't lived here long enough to leave the hard Chicago accent behind, but I catch myself using quite a bit of Aussie slang when I talk. Today I "whipped" up a card for a few challenges. Couldn't resist when I saw the Cupcake Inspirations challenge. Had to use my new kit stamps! I also used Simon Says Stamp! Card Exchanging Friends stamp and die set, Echo Park Country Drive paper pad, Perfect Polka Dot embossing folder, thread, Wink of Stella. Oh these are such beautiful colors together! Super cute! 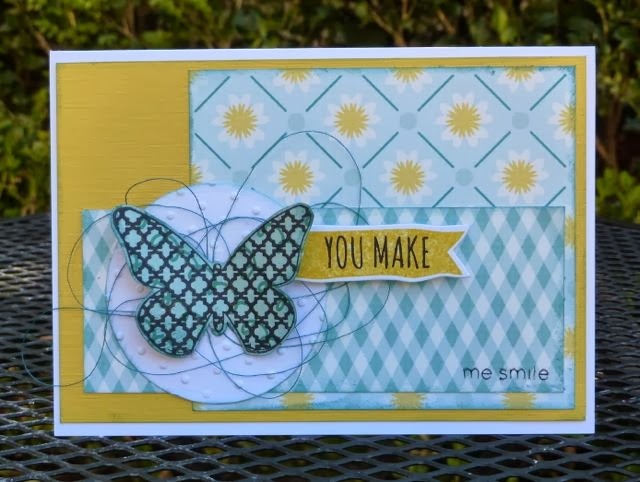 So glad you were inspired by this week's Butterflies challenge at Cupcake Inspiration! Great card with a nice text stamp, and great colors. Thank you for participating in Sketchy Colors, good luck. BEautiful card! Love all the different patterns and that butterfly! Thanks for sharing it at Cupcake Inspirations this week! And what a change from Chicago to Australia in more ways than one! Bet you don't miss the snow!